Enzymatic cleaning increases the profitability of membrane installations! The field of membrane filtration requires special attention due to its complexity and the high cost of filters. Loss of efficiency can occur quickly due to clogging resulting in slower production flow. In addition, corrosive products can degrade the membranes and reduce their lifetime. Accurate protocol and appropriate cleaning solutions can increase throughput and productivity. Perform +: A complete, unique, high-performance program! 2. Recommendation of a protocol and enzymatic cleaning solutions adapted to the complexity of the installation. ENZY + Classic: All-in-one enzymatic solutions that are efficient and easy to use. ENZY + Classic is suitable for an installation with little problem in terms of clogging. ENZY + Silver: All-in-one solutions with multiple enzymes. ENZY + Silver has been developed for more complex installations, that is to say with a higher risk of clogging (entering more clogging and high volumetric concentration factor (FCV)). ENZY + Gold: Concentrated solutions with multiple enzymes for specific use. ENZY + Gold offers solutions for very complex installations with very frequent losses in yields (high clogging input and very high FCV). 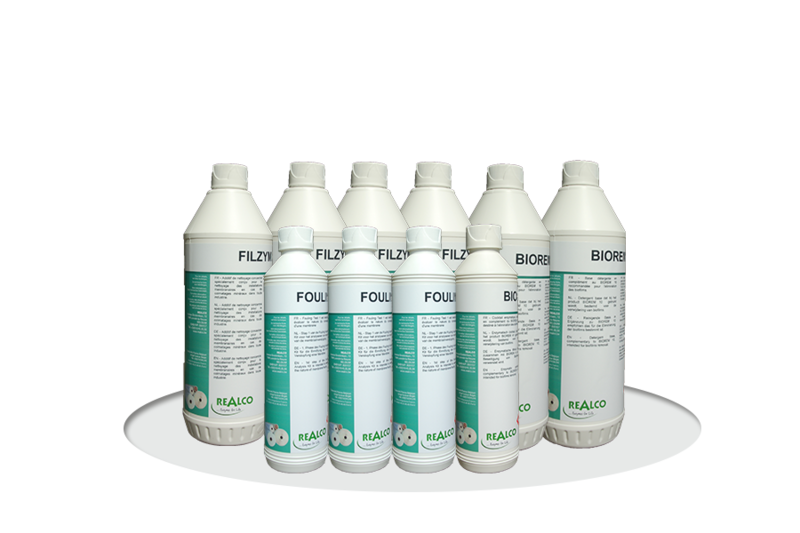 To achieve an optimal level of hygiene of the installations, Realco offers a range of products offering curative and preventive treatments of biofilms. The BIOREM range is a complex and very specific enzymatic cocktail which cleans and prepares the surfaces that biofilm form on. Once the surfaces are properly cleaned, the disinfectant completes the cleaning process. The membranes begin to clog rapidly, causing a drop in production flow. The pressure must be increased to maintain a required level of productivity. The level of production has fallen by almost 25% compared to the production start-up rate. Thanks to PERFORM +, the flow rates at the start of production are maintained without increasing the pressure. The production flow is more constant and increased productivity by 30% (click on graphs for larger images) !